Song is loud, accelerating, brief series of explosive “beech-er” or “whip-ity” notes. 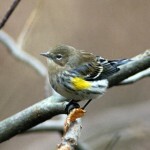 Description: Large and stocky; long undertail coverts give short-tailed appearance. Brownish-olive above; yellow below; red-orange legs; large eye with bold white eye ring that is sometimes broken on one side only. Male has gray hood; female has brown or gray-brown hood. 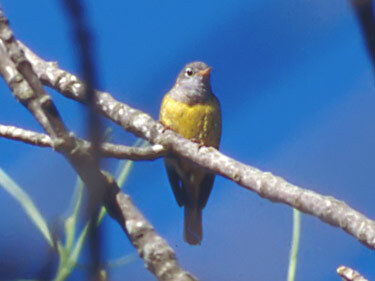 Immature has brownish hood and brownish breast band. Behavior: Nests and feeds on the ground; walks rather than hops. Habitat: Low woodlands with brushy tangles. 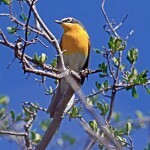 Where in Nebraska: Uncommon or occasional spring and fall migrant in eastern Nebraska.Rarely occurs in west. More often seen in fall than spring. 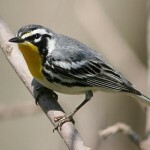 Fun Facts: The first Connecticut Warbler found and studied by a scientist was located in Connecticut, however they do not breed nor are they a common migrant in Connecticut.